Nissan got into the festive spirit and gave a school in Limpopo the gift of water. ROSSLYN, South Africa, 14 Dec 2017 – Bahlologa Secondary School in Lonsdale, Limpopo has been gifted a fully functional water system by Nissan SA, which was revealed to very excited and grateful community members, students and teachers. Earlier this year the Bahlaloga school submitted a request to Nissan for a water tank that would enable the school to use all four taps at the school instead of the one tap that supplies water to hundreds of students. A needs analysis was conducted after which Nissan decided to overhaul the borehole system, all four of the taps are now operational. Nissan puts great emphasis on their corporate social responsibility programmes which they run throughout the year where they get involved financially and include their staff. The staff from Nissan have pledged their time to the Bahlologa school and have assured the learners that there are people and companies, such as Nissan, that want to help where they can. 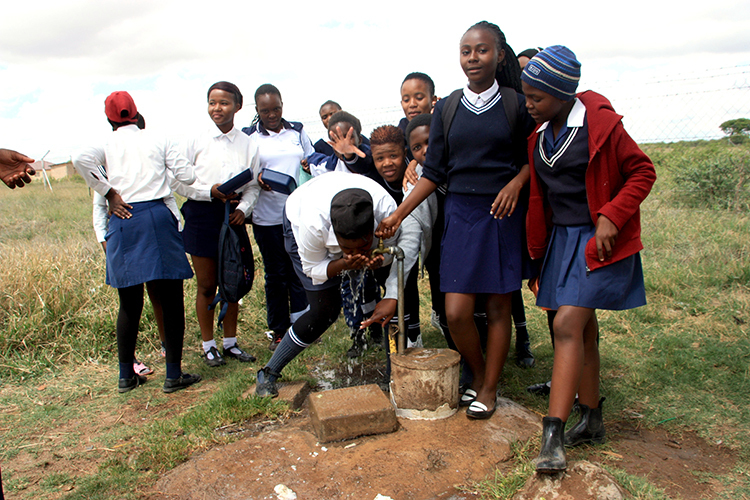 Ms. Mashiane, the school principle, said that: "This new water system is going to change our lives, the learners and staff now have access to four taps, and that's amazing” and that “it gives me great pleasure to know that there are companies out there like Nissan which listen to our pleas and help when we need it. We are very grateful for their kind donation."